Me thinks the last poster got mixed up with the Jolly Sailor next door. 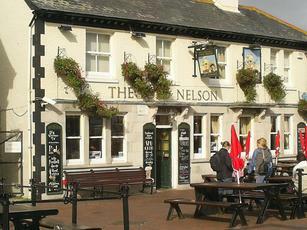 This is a Badger pub with a heavy music slant, suits the bike evenings on the quay during the summer. Standard Badger beer, usual tourist food menu, an acceptable pub in a tourist orientated area, if I visit I try to ensure it's off-season. Visited during a beer festival. Out of 15 beers listed, only four were available. Greene King IPA (you are joking?) Gk Buck Greene Governor, Oakham JHB and Everards Tiger. Ordered four meals and stressed to the bar girl that any side salads should be undressed. All four came dressed. Salad dressing should be put into room 101. I think they got the message when I asked for the desserts to be dress-free! Nice to see beers other than Greene King. Tanglefoot, Fursty Ferret and Hopping Hare made a welcome change. One of many pubs along The Quay, this is perhaps a bit more of a traditional boozer than some of it’s neighbours but naturally makes the most of the views with plenty of outside seating. Inside it’s an L-shape bar with a somewhat run down feel, and like many of the nearby hostelries it has a vaguely nautical theme with dark blue and cream paintwork and various parts of ships on display such as an instrument cluster and a anchor chain reel. The flooring is mostly old flagstones with some carpet around the perimeter, and there is a small stage area in the corner. It would appear that live music is on most nights, and the Sunday evening we were there it was a 60’s Rock’n’Roll band, who probably weren’t too bad but were evidently trying to play at a somewhat higher volume than their PA equipment allows, with the resultant music being rather distorted. A free standing wood burning stove stood at the front of the pub surrounded by piles of logs and a railing. Off to one side was an old space invaders game, and a plasma was on a wall to the left. Around the corner at the rear there was a pool table, table football game and a darts board. Unusually besides the usual condom machine in the gents, there was also one dispensing vibrators – just £5 including batteries, but I didn’t try one myself. Beers on tap were all from the Hall & Woodhouse stable with their Badger, Tanglefoot and Hopping Hare. Ciders were Stowford Press and Weston’s Traditional Scrumpy.